Can you believe that it is fall already. When I left for my break from my blog our garden was in full swing. We had zucchini and tomatoes coming out of our ears… now we are in the process of cleaning it up for the winter months. I already miss going to the garden to pick fresh tomatoes. Boy, where did the summer go to. Although I am sad to see the warm summer days are behind us and I am missing the long summer days, I do enjoy the cooler weather. All summer long I was taking long walks outside, but that has ended too. My walks have moved inside on the treadmill, it is not as enjoyable, but I do like being able to keep up my walking. Another thing that I am enjoying is cooking and baking with fall fruits and vegetables. I have always loved pumpkin baked in goodies. 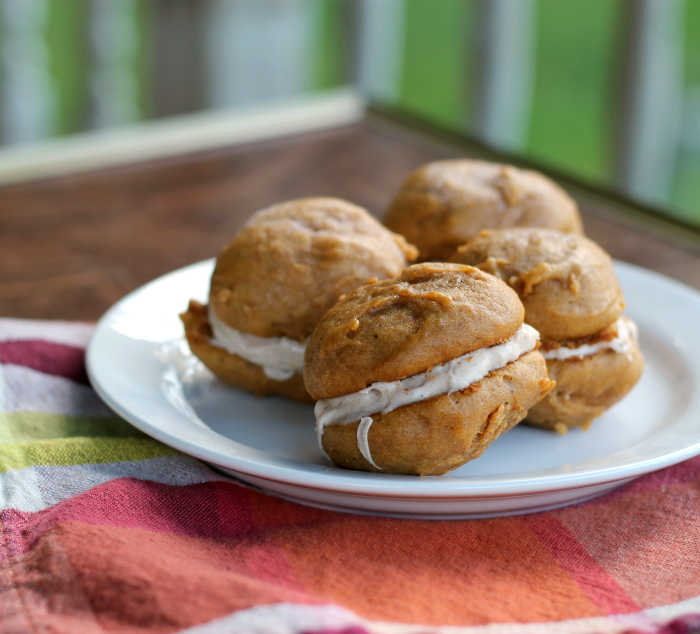 And baking whoopie pies has been on my list for the longest time. So this past weekend I took the opportunity to try making a batch. I filled them with a cream cheese filling flavored with cinnamon, ginger, nutmeg, and cloves. I love these spices with pumpkin; they are certainly the perfect match. 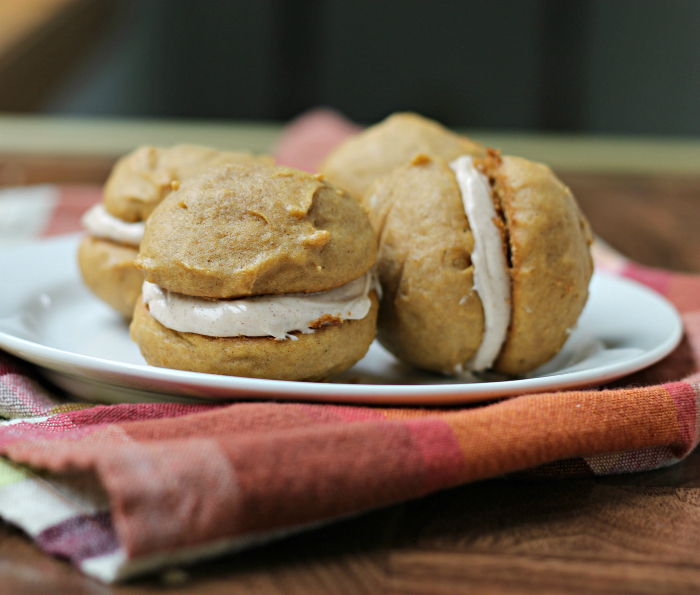 The whoopie pies are moist and tender… the filling was the perfect complement to the pumpkin in the whoopie pies. Also another plus they froze nicely. After being in the freezer a few days, they were just as tasty as the day that I baked them. I can’t wait to try other flavored whoopie pies. Chocolate cakes with a mint filling sounds good to me. But in the meantime I am loving these pumpkin ones. In a large bowl cream together the oil and sugars with an electric mixer. Mix in the eggs and then add the vanilla mix until well blended. Add the pumpkin and mix until blended. Sift together the dry ingredients, gradually add the dry ingredients to the wet and mix until all is well blended. Drop rounded teaspoon of batter onto the prepared baking sheet. Place in the preheated oven and bake for 10 to 11 minutes. Cool completely on a cooling rack. For the filling- in a medium bowl beat the cream cheese until fluffy with an electric mixer. Add the butter and beat in. Add the powder sugar and spice and beat until creamy. Spread a generous amount of filling on the bottom of a cookie and top with another cookie, to form your delicious whoopie pie. I am sad summer is over, but excited for all things pumpkin! These whoopie pies look excellent. 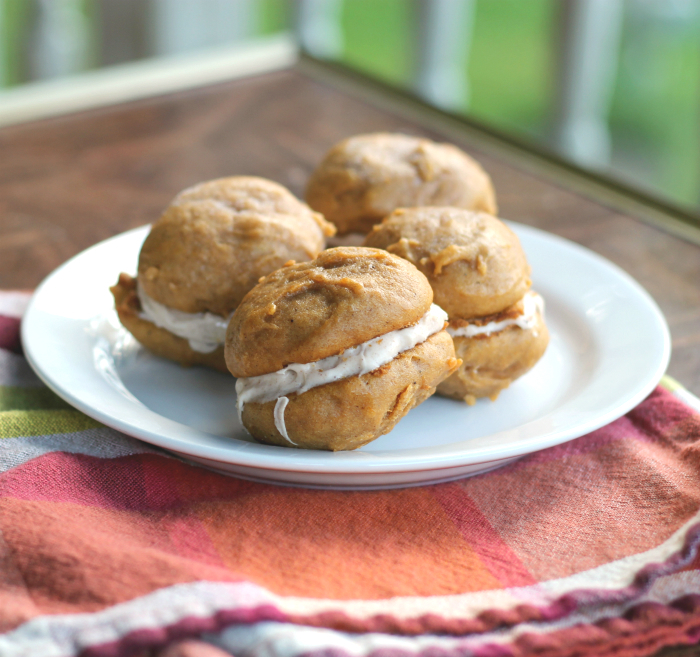 Hi Dawn, oh I love these whoopie pies with their flavored cream cheese filling, they are perfect. 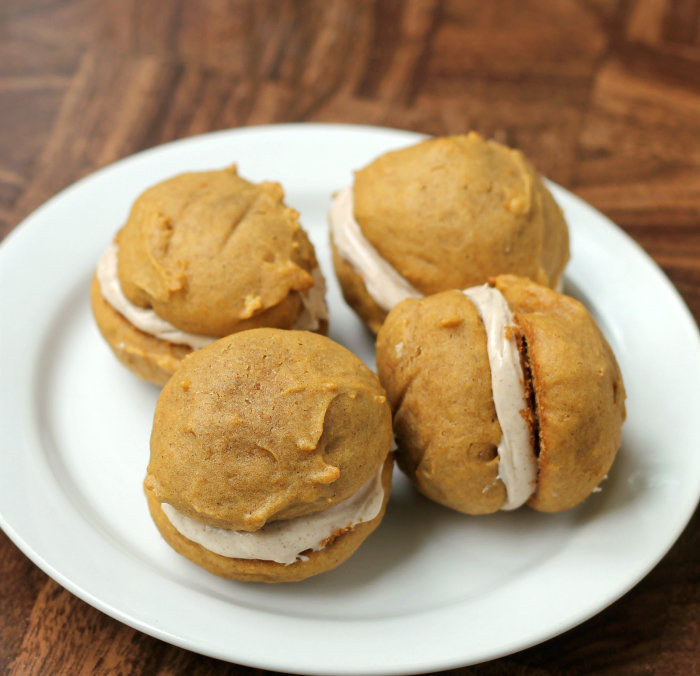 These look like a perfect fall treat!